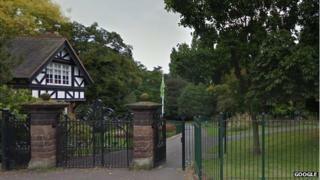 Three people, including a seven-year-old girl, have been injured after a firework went into the crowd during a display at a West Midlands Park. West Midlands Ambulance Service said a 23-year-old man was taken to hospital with an ear injury from the display at Brunswick Park in Wednesbury. The girl and a 47-year-old man were treated by St John Ambulance staff for minor leg injuries. Organiser Sandwell Council said an investigation would be carried out. On Twitter, the authority said: "Our thoughts are with the people injured and their families. "This is the first incident of its kind we have had in many years of putting on community fireworks displays." An ambulance service spokesman said the 23-year-old man was taken to hospital for precautionary checks and his injury was not thought to be serious. A further six people were treated by St John Ambulance staff for minor injuries, from slipping and falling over.